When you first look at these pictures of Kris you may see a beautiful young Black woman. In speaking to Kris, you will sense she is sweet, intelligent and kind. What you won’t see are the scars that are healing, from several suicide attempts. (Yes there were several) Kris had been diagnosed with depression, sever panic attacks and anxiety. She has been admitted to what she refers to as a “Psych Prison.” Dealing with all of the things that life can throw at us is difficult. Dealing with all of these things while suffering in silence with mental illness can take a toll on even the strongest person. On August 11, 2011 there was another suicide attempt, however after this one Kris made a decision to fight and fight like she never had before. Instead of looking at this as a shameful part of her past, she has celebrated this day for the past five years as her Life Anniversary. 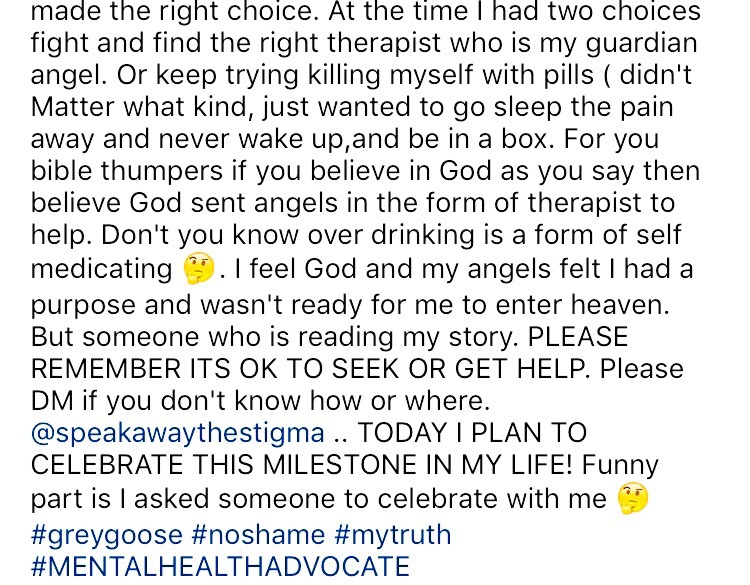 Kris credits herself for having the strength to ask for help, despite being the first in her family to deal with it and despite the stigma of mental illness in the Black community, but she also give glory to God and her guardian angel, aka her therapist! 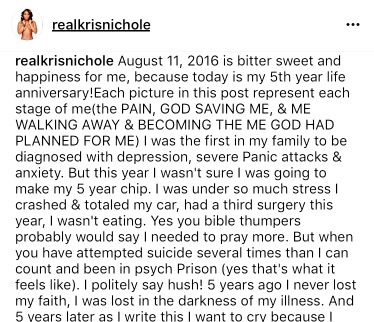 Her full post can read her full her Instagram page @realkrisnichole, however since it is private I am sharing it below. I am sharing this with her permission, and I thank her many times over for allowing me to do so. There stories are important. Talking and discussing these stories is what will help us to speak away the stigma. Previous Previous post: Dignity & Mental Health; Why awareness matters!